The police are believed to have received a warning in advance of the explosion, as they had been clearing the area before the car blew up. Locals reported hearing one and possibly a second loud bang, before the PSNI tweeted a photograph of a burning vehicle. Homes and businesses in the area have been evacuated. The PSNI has warned on its Foyle Facebook page that officers are concerned about a second car on the street. "As far as we know no one injured. There is another car we are not happy about. There are ongoing necessary evacuations," it posted. 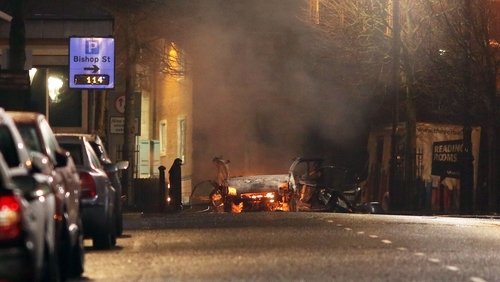 The local PSNI Twitter account posted a photograph from the incident on Bishop Street, showing a vehicle on fire after an explosion was reported. Police have asked the public to stay away from the area. "Police are in attendance at the scene of an incident in Derry/Londonderry city centre. We would ask for patience and co-operation of the public and the business community as we carry out our initial investigations," the PSNI tweeted. Tánaiste Simon Coveney condemned the incident in a tweet, calling it a "terrorist attack". "I utterly condemn the car bomb terrorist attack in Derry this evening. "There is no place and no justification possible for such acts of terror, which seek to drag Northern Ireland back to violence and conflict." DUP leader Arlene Foster tweeted: "This pointless act of terror must be condemned in the strongest terms. Only hurts the people of the City. Perpetrated by people with no regard for life. Grateful to our emergency services for their swift actions which helped ensure there have been no fatalities or injuries." Derry's mayor John Boyle said: "I would actually like to ask the people responsible for this what it actually was that they thought they were going to achieve. It achieves nothing, it didn't achieve anything in the past, it didn't achieve anything right now. "I have a question for them, what was this all about, because quite frankly this is not something that the people of this city wanted to see, it's not something they support and as Mayor of Derry City and Strabane District Council, I have to say I feel it incumbent upon me to speak out on behalf of the vast, vast majority of people in Derry, Strabane and indeed across this island, this is not what we want. "This is the past and it has to stay in the past. We don't want to see any more of it." Foyle Sinn Féin MP Elisha McCallion said the incident has "shocked the local community". "In particular, there are many elderly residents who live in the area who have been alarmed by this. "Thankfully no-one appears to have been injured. "Derry is a city moving forward and no-one wants this type of incident. It is not representative of the city. "I would encourage anyone with information about this incident to bring it to the police." In recent years, dissident republicans have carried out similar attacks outside the main police station at Strand Road. They will be suspected of having a role in tonight's incident. During the Troubles, the city's courthouse at Bishop's Gate was often a target for bombers.